Jungle Fever! In most parts of the South West of Western Australia you would not expect to find a lush tropical garden but with the correct plant selection, conditioning of the soil, fertilising and layering of plants, you can create your own piece of ‘paradise’ with a little help from my company Gardens from Eden. 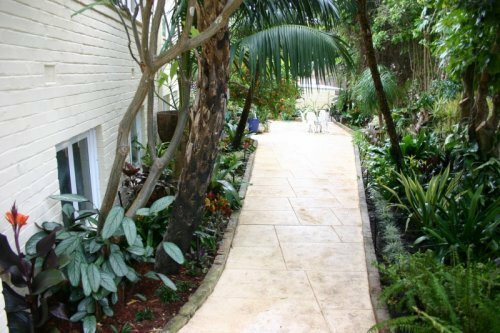 The aim of this renovation of an existing garden in Mosman Park was to create a lush and colourful tropical garden with a ‘jungle feel’. The original garden contained a number of large tree ferns, palms, umbrella trees, Hibiscus and New Zealand Christmas trees that provided a dense upper canopy to protect the home from the harsh coastal winds and provide some privacy from adjoining properties. Whilst it served these functions well, it cast a dense shade that only allowed in a little natural light, particularly during the winter months. The plantings below were very ‘green’ and mainly contained ferns and an exquisite collection of Clivia’s and epiphyllums. We dug up these collections before the main work commenced and then re-incorporated them into the new planting design later on. Plantings were layered or tiered to provide good ground cover, density of planting and varying height. Specimen or ‘feature plants’ were to be used as ‘highlights or to draw attention to certain parts of the garden and to provide height. These feature plants included palms, a large cycad, Agaves, large bromeliads and a transplanted bird’s nest fern and pony tail palm from the original garden. Furthermore a large metal urn, low bowl and bench provided focal points in the garden along with a terracotta pot that was relocated from another part of the garden. The owners were delighted with the finished effect and whenever they feel like a tropical break or holiday all they have to do is step outside in their own piece of paradise. Maybe you could also catch ‘jungle fever’ this year and holiday at home.